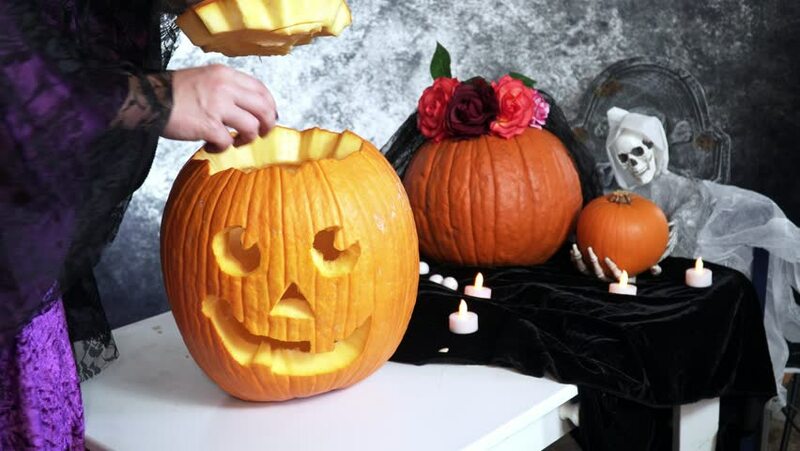 4k Woman puts candle inside Halloween Jack-o-lantern pumpkin on the table decorated with pumpkins, tombstone, ghost, candles and black velvet. hd00:40HD. Slow motion. Halloween greeting card with Jack-o-Lantern pumpkin and ghost moving in the background. Text Space At Right. hd00:18Fog pours out of the mouth of a Halloween jack o'lantern surrounded by autumnal gourds and candles. The scary holiday scene embodies the spirit of Halloween, the supernatural, and trick or treating.